Le Cercle, for me, was almost entirely static. 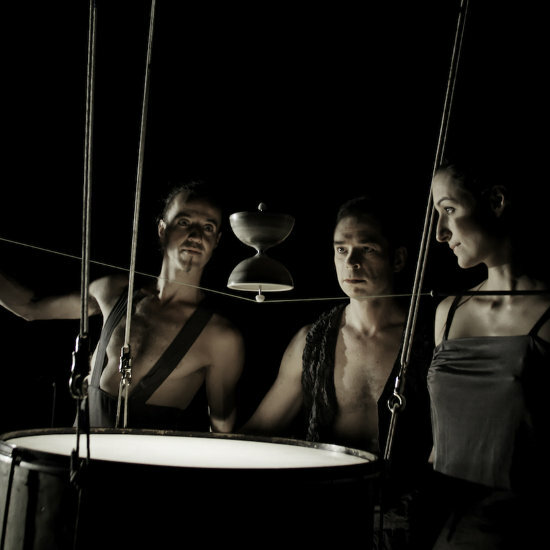 It moves through scenes distinguished by the equipment/instruments used, by the particular foregrounded performer, by the array of tricks exhibited by diablo artists Roman Müller and Petronella von Zerboni, by the live music, and yet each scene is discrete, drawing nothing from the last. There is no development, no progression, no sense of depth. Müller and Zerboni, despite duetting for most of the piece, have little friction or commonality, and instead of a narrative relationship – or else something constructed, grown more organically from their real and intrinsic characters – there are the flirty, challenging glances, man to woman, woman to man, familiar from countless corporate-grade double acts. Devised as an exploration of the circle, of loops and circuits, at Auch Le Cercle was weakened by front-on presentation and constricted by the stage of the Chapiteau Cathédrale – such that the repeated shapes and figures were experienced too literally, too coldly. Its ideas, this time anyway, failed in execution: watching cups rolled in intersecting arcs as Mischa Blau, at cello, layered music felt hackneyed and clichéd; a sequence where Blau drums and Müller and Zerboni, positioned either side, participate by bouncing a diablo across the skin, was off-rhythm and ponderous. Simple in theory; laboured in realisation. The use of Blau as a full performer is also a problem. He is not a natural actor – nor, as a confident guess, a trained one – and looks at times as though he is executing a simultaneous double parody of a pantomime and kabuki artist: excessive postural rigidity and inexplicably heavy make-up. Called upon to wield a cello bow like an épée he's kickably irritating – a prancing peacock, an insufferable dandy. Certainly there are striking images – the line of a fast-spinning diablo tilting impossibly upward, like a free object in a space shuttle as it clears gravity; or Blau, seated, for a moment bearable, playing tiny bells stuck by suckers to the underside of a suspended drum, with the last bell, and last note, carried out of reach as the instrument is raised. But what Le Cercle feels like most is a large store of technical skill that might be drawn upon in the creation of a more ambitious and complete show; it's a little unfair to say it, but InStallation, which the three members of Tr'espace perform in, and which shares much of its material with Le Cercle, is where this all comes alive.